Internet of Things (IoT) based application is catching up fast with several technology companies investing heavily in modernising and digitising the borders. As the Indian government fences its border with Pakistan and installs sophisticated security and surveillance equipment. Devices would have built-in IoT modules and applications which can talk to one another, irrespective of distance and time. Fast communication and action would be critical in protecting borders from unwanted intruders and terrorists. Delhi based CRON Systems is a disruptive startup within the multi-billion dollar perimeter security and surveillance technology space, developing state-of-art Intrusion Detection Systems that implement the latest technologies and designs at a fraction of the costs of other leading products in its space. 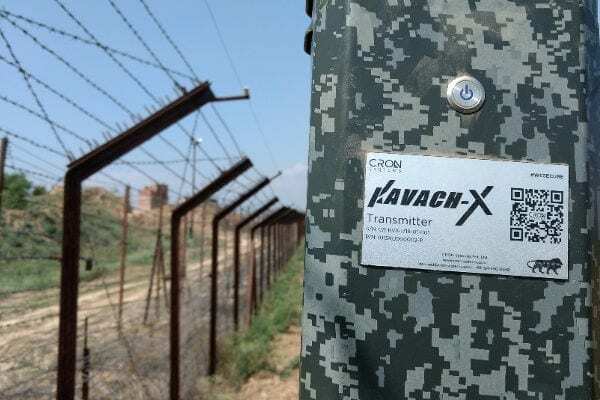 Right now CRON Systems are already been successfully deployed by India’s Border Security Force (BSF) at the sensitive Indo-Pak and Indo-Nepal border. CRON has been working on solving issues and automate perimeter security for almost four years now. Now it is looking at securing camps, other hostile installation in the forthcoming quarters. Kavach Z is a mono-static sensor platform coupled with LiDAR for detection, thermal cameras for accurate intrusion verification and other mono-static sensors. It has a 360-degree range of 200 metres and is capable of recognising friends or foe movement. As soon as an intrusion happens or a movement is detected beyond the perimeter/border, an alarm is raised and an alert is sent to the miCRON (C&C Platform) over CRONet, our proprietary encrypted wireless communication system. Simultaneously, the nearest drone and rover are sent an alert for live surveillance and visual verification. “The real challenge for us was to develop a product that can be used with ease by the end user. In the harsh climatic condition and terrain, it is important to provide solutions and technology that can be used with ease by our soldiers. Keeping this in mind we built the QRT, which is present in the Morchas with two communication keys which can be further augmented to eight for easier communication. In QRT you just need to press the button and the relevant alert and message goes to the higher authority,” he narrates. The company spent large amount of time at the borders to understand the on-ground realities and pain points for soldiers at the front. It realised that each border, especially in India, with diverse climatic and terrain condition, requires specifically designed products in a cost effective way. Accordingly it went on to develop products to support the first line of defence for country. “We had to test our products in real life situations, come back with feedback and further innovate to build on it. Finally we were able to build an end-to-end solution that worked efficiently for our security forces. IoT-based security system must be easy to design, install, maintain and use. And one size does not fit all. To maximise the potential of IoT in the security and surveillance field, it requires an in-depth knowledge by suppliers who understand how each feature or component works together, can design a solution that can be used to solve specific challenges, and are able deliver it as an integrated offering whose long-term value has more value than just the sum of its parts,” he explains. “During the journey to develop an indigenous solution for Indian security forces, we realised that any product that is successful in India can be deployed across the globe looking at the diverse and difficult terrain and weather. Realising the opportunity, we are now expanding our global presence where we are looking at markets like Asia, Africa and Middle East,” Chhabra informs. In the coming years, there would be greater use of Video Management Systems (VMS) to search big data in order to pull up relevant events, people, locations, times, colours and keywords. Such tools will assist business operators to turn big data into critical information that aids in loss prevention, marketing, operations, and customer service.